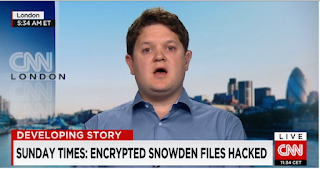 After his disastrous foray on to CNN, where he more or less admitted that his articles about former NSA contractor Edward Snowden had been sourced by the UK Government - and therefore approved by MI5, MI6 and GCHQ - Sunday Times hack Tom Harper has turned his attention to the shortcomings of the Metropolitan Police, and in particular the original Stephen Lawrence murder inquiry. Here, it seemed, was an ideal opportunity for Harper to put his derided broadcast appearance behind him, and do some proper old-fashioned investigative journalism, the kind of thing for which his paper was renowned - well, before Creepy Uncle Rupe got his hands on the title, that is. “Police watchdog investigator ‘in Lawrence cover-up’” read yesterday’s headline. So what was the story? “THE Independent Police Complaints Commission (IPCC) is examining one of its former investigators over the alleged failure to disclose suspected police corruption in the original Stephen Lawrence murder inquiry … A review by an IPCC official has concluded that ‘there is material to suggest Roy Clark provided misleading information’ to the 1998 Macpherson inquiry into police failings in the case”. There’s more: “Clark, a former deputy assistant commissioner of the Metropolitan police, became the IPCC’s first director of investigations in 2004 … Documents obtained under freedom of information laws reveal that he is at the centre of the investigation into allegations that senior police officers had failed to hand over key information to Macpherson”. This all looks most accomplished. However, and here we encounter a significantly sized however, the story of Roy Clarke’s evidence to the Macpherson inquiry is not a new one. It was covered comprehensively by the Bellingcat site, which promotes citizen investigative journalism, last month. Harper cites former Met Commissioner John Stevens as failing to provide full information to Macpherson. This is at the top of the Bellingcat report. Here’s the text: “Early April ’15, the Metropolitan Police Service (MPS) referred former Commissioner Lord John STEVENS of Kirkwhelpington to the Independent Police Complaints Commission (IPCC). This was a result of the findings of the 2014 ELLISON Review of possible police corruption in the Stephen LAWRENCE case and a formal complaint by Stephen’s father, Neville LAWRENCE”. No need to read the ST. Worse, as Peter Jukes has confirmed on the Byline Media site today, “What the Sunday Times fails to report, however, is Roy Clarke's links to the third abortive investigation into the Daniel Morgan Murder”. Concluding his article “There are other connections between the Stephen Lawrence and Daniel Morgan murders which I will report on as soon as possible”, Jukes shows he is already way ahead of the likes of Tom Harper. Investigative journalism, Tom. You should try doing some occasionally. "Early April ’15, the Metropolitan Police Service (MPS) referred former Commissioner Lord John STEVENS of Kirkwhelpington to the Independent Police Complaints Commission (IPCC)." Will Neil Wallis be called as a character witness? Tim, You made a big mistake there. You put "CNN" and "journalism" in the same sentence.